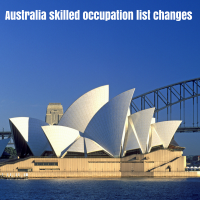 The Skilled Occupation List of Australia is revised every year based on the recommendations of the Department of training and education. The consultation process also includes experts of various industries. Here, the importance is laid on the requirement of the industries, so it clearly indicates that immigration is need based in Australia. Rather than welcoming thousands of people, who stay unemployed if there is no right amount of vacancies in the job market? Candidates need not worry as the change is not new; Australia Immigration updates the Skilled Occupation List every year. If your experience and educational background matches with the SOL and if you clear the point-based test, then definitely you can become an Australian Permanent Resident. There are instances when Australia announced occupations to be removed but later replaced them. So, this announcement is not sure, one has to apply soon, before the Australia Immigration makes it an official announcement. If your application is in the processing stage, then changes may not apply to you. So get ready to apply for Australia Immigration. Therapists, Podiatrists, and Speech Pathologists.